Sarah. Passed first time @ Paisley Driving Test Centre. Really enjoyed my lessons with Ricky he is a great instructor. He is very patient and great at explaining areas for improvements. 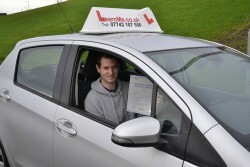 He did the impossible and helped me pass my test first time. I would highly recommend him as an instructor. Thanks again Ricky, I already miss the laughs. Thomas. Passed @ Shieldhall Driving Test Centre. Fraser. Passed first time @ Paisley Driving Test Centre. Passed test first time as Ricky was an excellent instructor, who was patient and encouraged me during all my lessons I would definitely recommend him as a driving instructor. Alan. 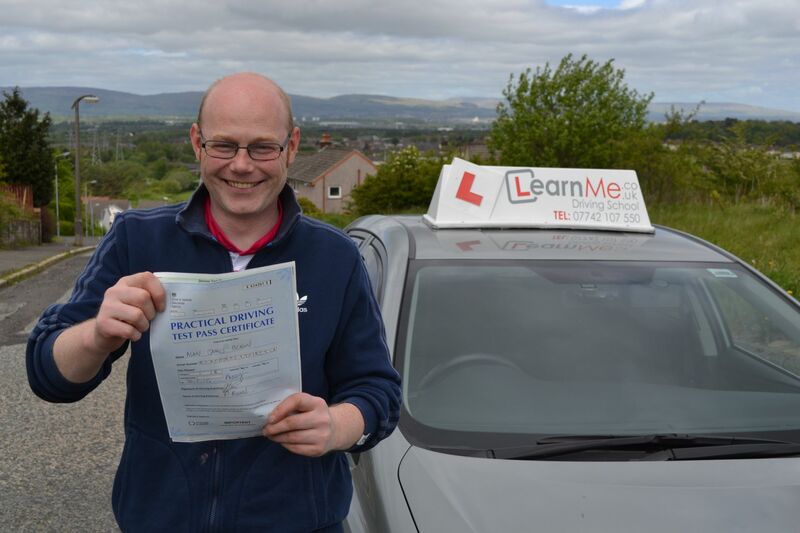 Passed @ Paisley Driving Test Centre. Ricky was a great instructor. Even when my head went down he always managed to pick me up again. Would recommended to anyone and everyone. 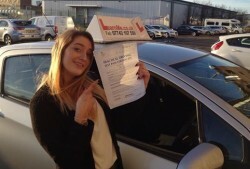 Anniesland driving test pass for Melissa. 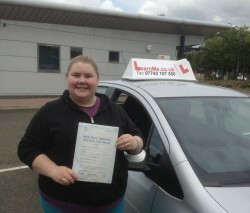 Melissa passes @ Anniesland Driving test centre Glasgow. Ricky is a great instructor, I would recommend him to everyone possible! I couldn’t of done it without his help and support ! Erskine driving test pass for Kirsty. Kirsty. Passed first time @ Paisley Driving Test Centre. My lessons with Ricky were really good I feel like every time I went out I actually learned something and we built up a good friendship where I could just say if I felt I was struggling with something and I liked that. Ricky always believed in me, even when I felt like just giving up driving and that I would never pass my test, but I got there in the end. Linwood driving test pass for Lauren. Lauren. 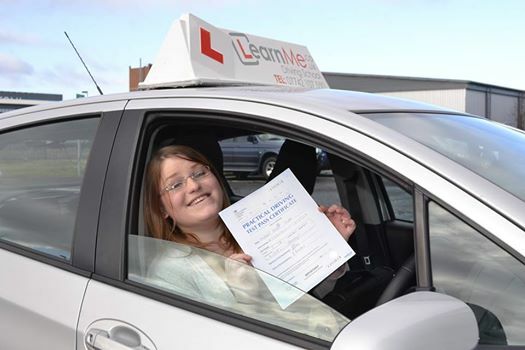 Passed first time @ Paisley Driving Test Centre. An absolute Saint! Not only did he have to deal with a pregnant hormonal potty mouth, he also got me through my test first time with only 4 weeks to spare till my daughters due and constantly reassured me. 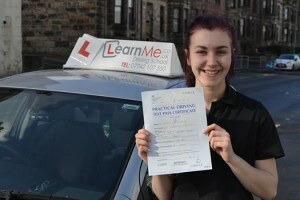 Paisley driving test pass for Samantha. Samantha. Passed first time @ Paisley Driving Test Centre. I found that Ricky was very pleasant to talk to and I felt very comfortable with him in my presence. Ricky’s instructions were very clear and precise and if I made any mistakes Ricky explained it clearly where I had went wrong. 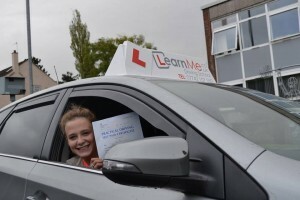 Always had a good laugh and will miss taking lessons now that I’ve passed first time. I highly recommend everyone to take lessons with Ricky and learn me driving school. 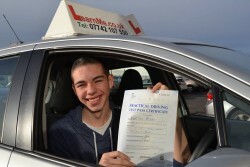 Johnstone driving test pass for Dean. Dean. Passed first time @ Paisley Driving Test Centre. Really good experience doing my lessons with Ricky, he never lets you down, turns up on time, everytime and gives a lot of feedback with cameras in the car and reference points that really do help. His prices are reasonable and driving with Ricky has been great. Thanks mate for all the time you gave. 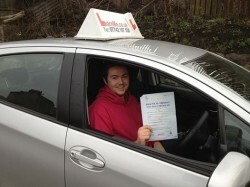 Linwood driving test pass for Alan. Alan. 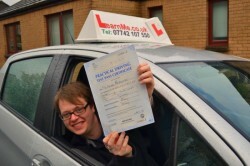 Passed first time @ Paisley Driving Test Centre. Would like to say a massive thank you to Ricky for all his help on getting me through my driving test in plenty time for my baby arriving. I would highly recommend Ricky to both new drivers and drivers like myself who have started and stopped lessons for a few years. Could not meet a nicer guy, extremely patient and understanding when I am sure he could go crazy at times especially at the start when most learners are pulling out onto oncoming traffic or stalling in the middle of busy roads. Also very accommodating with lessons especially with myself who works shifts so can’t commit to the same days every week, more than one occasion he came out on his day off or at weekends when I am sure he had better things to do. Thanks again Ricky!! Alan McGrory. Paisley driving test pass for Monica. Monica. Passed first time @ Paisley Driving Test Centre. 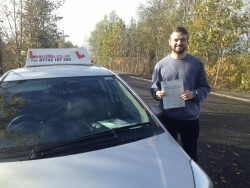 Ricky’s calm approach to teaching with a sense of humour helped even myself to overcome self-doubts and become a confident driver. 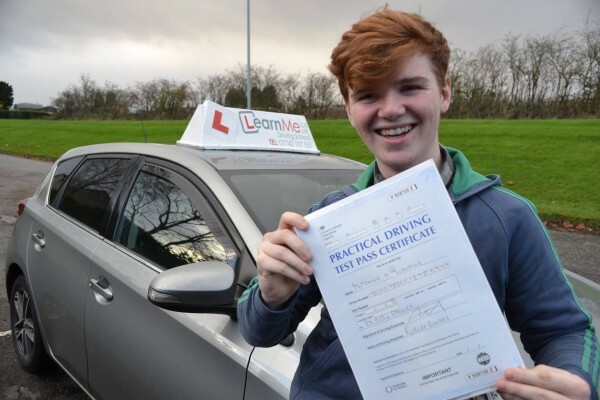 Having always struggled with self-confidence, Ricky’s patience in going over simple manoeuvres time and time again was really helpful, and passing first time was a huge boost for me. Glenburn driving test pass for Dennis. Dennis. Passed 2nd time @ Paisley Driving Test Centre. Ricky helped me to pass my test in August this year. He is a awesome instructor. He gives you loads of great advice. I would highly recommend him. Barrhead driving test pass for Joe. 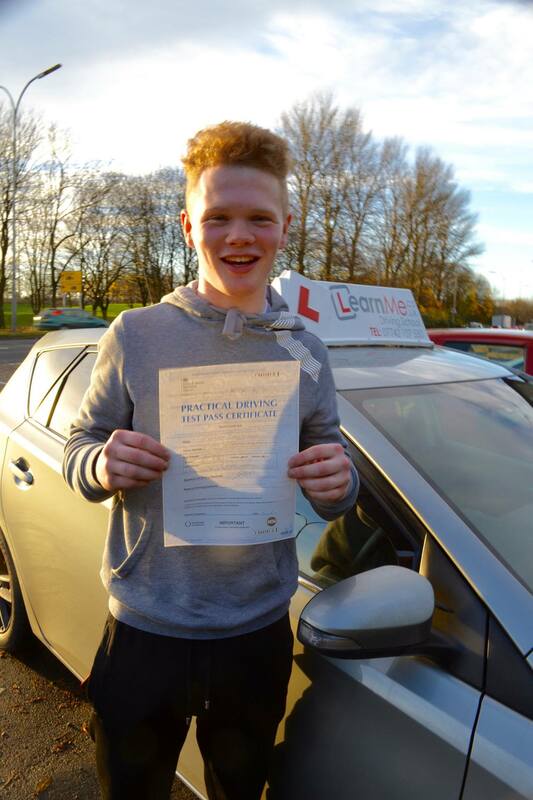 Joe passed first time at Paisley Driving test centre. Great and flexible lessons. Got straight onto driving out on the road, good 2 hour lessons, more effective. Puts in for theory and test. Less stress. Agree when ready to take test. Passed first time down to great instructor. 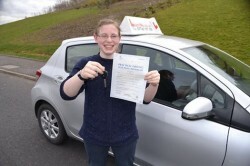 Erskine driving test pass for Avril. 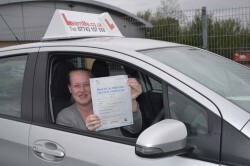 Avril passes at Paisley driving test centre. 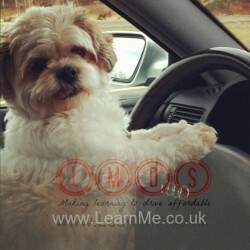 I learned to drive with Learn Me Driving School & couldn’t be happier. As a nervous learner Ricky was incredibly patient and friendly. He quickly built my confidence in my driving ability. I felt at ease which made it an enjoyable experience. His teaching methods helped me greatly & I will continue to use these skills. Excellent Instructor & Highly Recommended!! 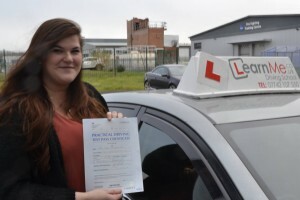 Linwood driving test pass for Kerrie. Kerrie. Passed first time @ Paisley Driving Test Centre. My Experience with Learn Me Driving School has been the best by far! Previously I had 2 other driving instructors & did not feel they were helping me to drive well . I looked into Learn me driving school & gave Ricky a call . Thank god I did ! I felt relaxed and in a easy enviroment not uptight like previously. When I found out the price of the lessons I was very happy as it is great value for money. I passed my test today 5th march 2014 & I can honestly say I couldn’t have got through my test without Ricky’s help ! Thanks again Ricky & good luck to everyone who call Ricky ! Glenburn driving test pass for Micheal. Michael. 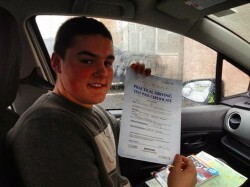 Passed first time @ Paisley Driving Test Centre. I started taking lessons with Ricky and Learn Me Driving School and although i was nervous he put me at ease straight away. His teaching approach is very much laid back. 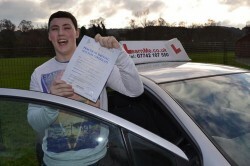 Every lesson he would crack a joke or two whilst still taking the driving aspect seriously. I would definitely recommend Ricky to anyone. Ricky is a dyno instructor. David. Passed first time @ Paisley Driving Test Centre. Great experience from start to finish, Ricky is friendly, patient and very helpful with a great sense of humour. He has a way of explaining that makes it seem simple and easy. A down to earth instructor, that I would highly recommended to anyone. Samantha. Passed first time @ Shieldhall Driving Test Centre. Thanks very much Ricky for all your teaching and patience on our 2hr lessons over the last month and a half. I learned soooooo much and because of you, I passed my test (2nd time), first time with a great instructor, you. Would recommend you to anyone and everyone that’ll listen. Thank you again and good luck with your next new and future learners. Govan driving test pass for Courtney. Courtney. Passed first time @ Shieldhall Driving Test Centre. Out of the three driving instructors I had, Ricky was definitely the best! Third time lucky and all that! Very hands on with his teaching, both the technical side and the practical side. Makes you feel comfortable and in control whilst you’re driving. Just like driving in the car with your pal and a good laugh. He’s Easy going and a brilliant teacher, definitely pass in no time if you choose him!